I can just imagine the “oh no” moment that rippled through Feedly last week when they learned that their big new release for iOS 9 crashed on launch for iOS 7 and 8 users. Their first response: add a hastily-written warning to the App Store description. Their second response: fix the bug, fast. It was ready the next day. Apparently, Apple has a way for developers to rush the very occasional critical fix into the App Store, sidestepping the normal, weeks-long approval queue. A big thank you to Apple for expediting the review of 30.1.0 and fixing the crash issue for iOS 7 and iOS 8 users! Apple’s App Store fast track provides a safety net, and I don’t blame them for using it. 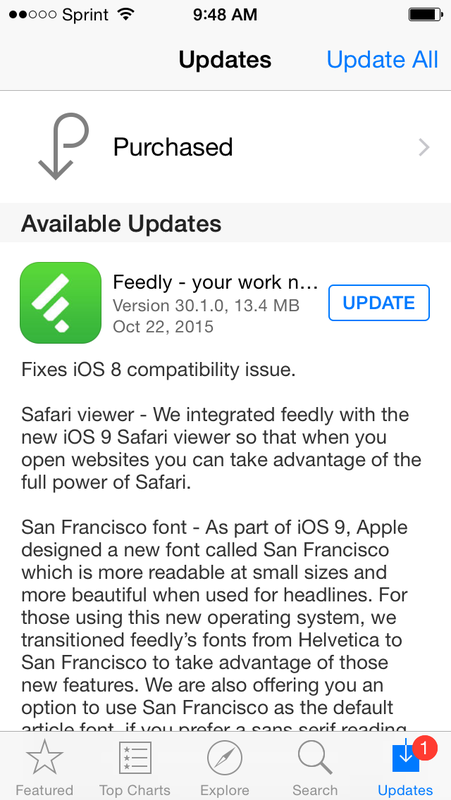 Because Feedly could recover fast, hardly anybody will remember this gaffe, and it won’t cost the company very much. I actually feel slightly bad talking about it, because it keeps the memory of this bug alive. But it illustrates such a simple equation: the faster you can recover from failure, the less perfect your product has to be when you ship it, and therefore the less expensive it is to build and support, and the faster your company can move. I’m not advocating for delivering buggy product on purpose. Follow good development practices and test for important risks to deliver the best software you can as fast as you can. But when you inevitably deliver a bad bug, being set up to recover fast means you can deliver without worry. I remember when the best way to get software to users was to mail it to them on CDs. A bug of this magnitude was a much bigger deal then. It was harder to warn users of the problem, and lots slower and more expensive to correct it. 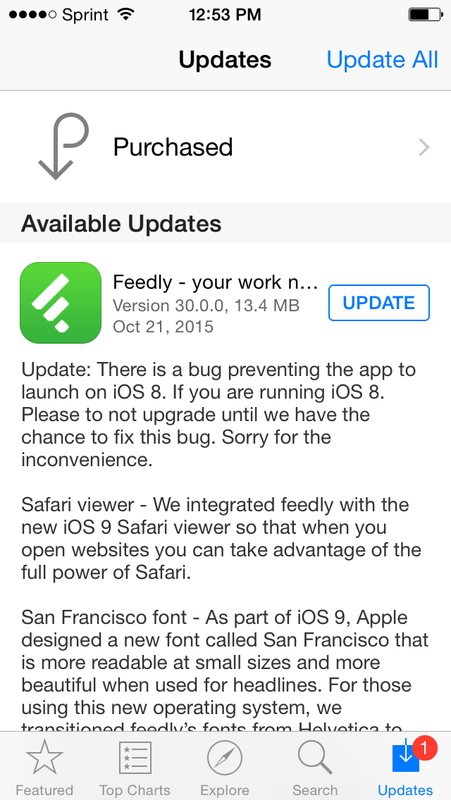 In that world, Feedly’s bug could have damaged their reputation for a long time. So back then it made sense to test more thoroughly — and therefore spend more time and money before releasing. But today, in a world of Web software and 24-hour emergency App Store turnaround, you’ll deliver faster and with less expense when you set yourself up for fast failure recovery. Continuous integration and continuous delivery are usually a part of that strategy. I agree with your general point. I do feel obligated to point out that Apple only gives you one or two of those kinds of expedited reviews a year, and there’s no guarantee that a) you’ll get one, or b) it will goes as fast as the one shown here. The advice is definitely applicable in the no-review world of Android, though. Thanks for that info, Rick. I tweaked the text to avoid the thought that critical fixes can be fast tracked at will.